Local authorities around the UK have been challenged over the involvement of children in events to mark Armed Forces Day this weekend (Saturday 30 June). Human rights groups warned that the armed forces are increasingly inviting children to handle weapons at such events, with very few regulations over what is allowed. The Peace Pledge Union (PPU) has been contacted by people around Britain, including parents and teachers, who are alarmed that local authorities are marketing Armed Forces Day events as “family fun” and giving children an unrealistic image of war. Fears have grown since an armed forces event in Leicester last weekend, where the mayor had assured local people that no-one under 16 would be allowed to handle weapons. In reality, children of primary school age were invited to handle guns, and an army officer called the police to try to remove peaceful demonstrators. Much of the publicity for Armed Forces Day is aimed at children and families. Examples include a poster produced by West Lothian Council, which promotes Armed Forces Day as “a fun-packed free event for all the family”, with a picture of a small child playing while troops appear in the background. At St Peter’s Square in Manchester, children will be invited to “sit in the cockpit of a real RAF jet” and “wear real military kit”. Seaford is hosting a “children’s funfair” alongside a military parade. The national event for Armed Forces Day will this year take place in Llandudno in North Wales, with troops marching amidst children’s activities and “family” entertainment. But the PPU predicted that there would be protests against Armed Forces Day in more towns and cities than ever before. As well as a major protest at the national event in Llandudno, protests and vigils are expected in places including Glasgow, Southampton and Blackpool as well as smaller towns such as Folkestone, Guildford and Bury St Edmunds. Armed Forces Day was introduced in the UK in 2009, in the wake of widespread public opposition to the wars in Iraq and Afghanistan. 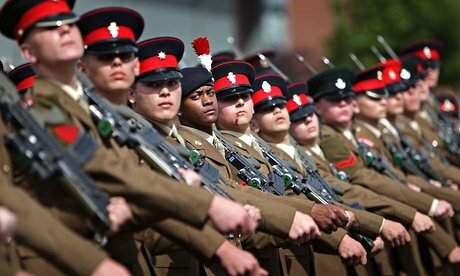 By promoting ‘respect’ for the armed forces, critics say that it encourages support for war by the back door. Many Armed Forces Day events are funded by local authorities, some with grants of up to £10,000 each from the Ministry of Defence. Figures for the total cost to taxpayers of Armed Forces Day have not been provided. Symon Hill of the Peace Pledge Union, who will join the protests in Llandudno on Saturday, said: “No other institution in Britain could get away with treating children like this. Armed Forces Day gives children the impression that war is exciting and uncomplicated. Young people have a right to make up their own minds about complex ethical issues as they grow up, not to be swamped with thinly veiled pro-war propaganda.